No. 14 (Selby House) It is a listed building grade II and was re-fronted in the 18th century on an older timber-framed building. Some 16th century wall-paintings were uncovered in 1962, but we do not have any photos. Behind Nos. 14-26 there is a grade II listed barn, built in the 17th century, timber-framed with brick infill and some rebuilding in brick. It has an old tile roof with irregular openings, cart doors right of centre and a loft door on the left. There are wind braces in the roof. Nos. 16-22 are the white painted buildings with a high arch. 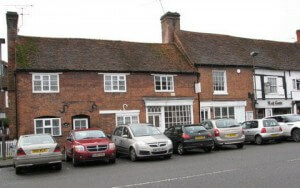 They are 16th century timber-framed buildings with subsequent brick infilling listed grade II. They used to be The Saracen’s Head, another coaching inn built at the end of the 16th or the early 17th century The building was bought by William Weller from John Lawrence in 1775 after the pub moved to Whielden Street in the early 1700s. As shown in the photo gallery below, no. 16 was once Owen Edgington’s saddlers shop (having previously been Jonny Langston’s saddlery for whom Owen Edgington had worked) and later was split into two shops, one the saddlers and one Frederick Edgington’s grocery shop, probably run by the son of the saddler. A big change came around 1950 when Rances opened up as Fishmongers and Fried Fish at the rear. Mr. & Mrs. Mummery then followed in the same trade. Around 1970 the business changed to a VG Grocers, run by Fred Lane and Bill Spilstead. Nos. 24-26 were re-fronted in the 19th century with an old tile roof and are listed grade II. This building has also seen many changes. Nos 28-30 were built in the early 19th century in red brick and are listed grade II. In the photo gallery below are a photo and some drawings of no. 30 taken from a book published in the 1930s. In 1984 Frosts took over no. 30-28 as Estate Agents and Agent for Abbey National. Previous to this it was know as Butler & Pike Estate Agents, owned by Mr. Elgar Pike who was well known in this town as a Councillor and who had a wide knowledge of the history of many towns, about which he wrote many articles.